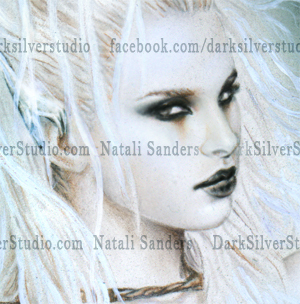 In 2012 I drew, "Lycanblade, the Beginning," with airbrush, oil paint, and prismacolor pencil on Strathmore 14x17 paper. A Blade is a human species that forms liquid silver titanium armor over their entire bodies. It is used in battle or for elaborate displayed occasions. Also, it’s forbidden for Blades to have a physical relationship with werewolves, for fear of the offspring and its potential. But as every story with a forbidden rule, someone has to break it. Whaaaat?! Autumn Deloncré is a Blade and Vengeance Haviour is the Alfa leader of his werewolf pack. The two of them knew their love was forbidden, but despite everything they married and soon after they conceived a child. When both of their family’s learned of their treason, they seized the new born baby and killed the two lovers before the races as an example. The two races feared the newborn hybrid and so the town witch was then given the task to kill the offspring, to make sure it would be destroyed. Once the witch took the infant girl and was alone to complete her task, she couldn't harm her. So instead, she hid the baby in the dungeon where she would look after her. That night she named her, Jozet Deloncré. As Jozet grew, the witch noticed permanent formations on the child. 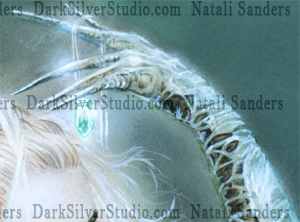 She had formed silver claws on her left hand and silver tipped ears. Sometimes the blade wrapped around her body into an elaborate protective armor, but it was sporadic, like she had no control over it - worsening during full moons. Jozet, not understanding what she was, the woman finally told her at sixteen that she was a Lycanblade, and explained what happened to her parents and why she was the only one of her kind. So after the witches story, Jozet sat in the dungeon, trapped with anger trying to control the Blade while waiting for the day she could avenge her parent’s deaths. This print is reproduced on high quality 100lb Cougar, canvas paper. Stunning quality and packed into a protective archival sleeve.